Whether you're looking for a light dessert or a healthy snack, this loaf fits the bill. Lemon and blueberry taste great together and I find the combination of primarily whole-grain, gluten-free flours works really well in this vegan goody! Preheat oven to 350. Spray loaf pan with cooking spray and place blueberries in the bottom of the pan. Arrange them to get a single, even layer. Set aside. In a small bowl or glass measuring pitcher combine non-dairy milk and vinegar and let sit while you assemble dry ingredients. Combine dry ingredients (NOT the blueberries) in a large bowl and whisk together. To non-dairy milk/vinegar mixture add the rest of the wet ingredients and whisk well. Add wet ingredients to dry and stir until well combined. Pour batter over blueberries and bang the pan gently to even out batter, remove bubbles and so the batter can squeeze through some of the blueberry nooks and crannies. Bake 45-50 minutes. Let cool before flipping loaf out of the pan and slicing (with blueberries on the top side). You can purchase these flours or run whole rolled oats, sorghum and millet through the blender to make flour. Make sure it's very fine. If you don't have a high-powered blender, purchasing the flour may be your best bet. Aquafaba is the juice drained off from canned chickpeas. It's a great egg/egg white replacement. Simply save the liquid next time you open a can of chickpeas and store it in the fridge. Great for use in baked goods, meringues, pancakes, etc. 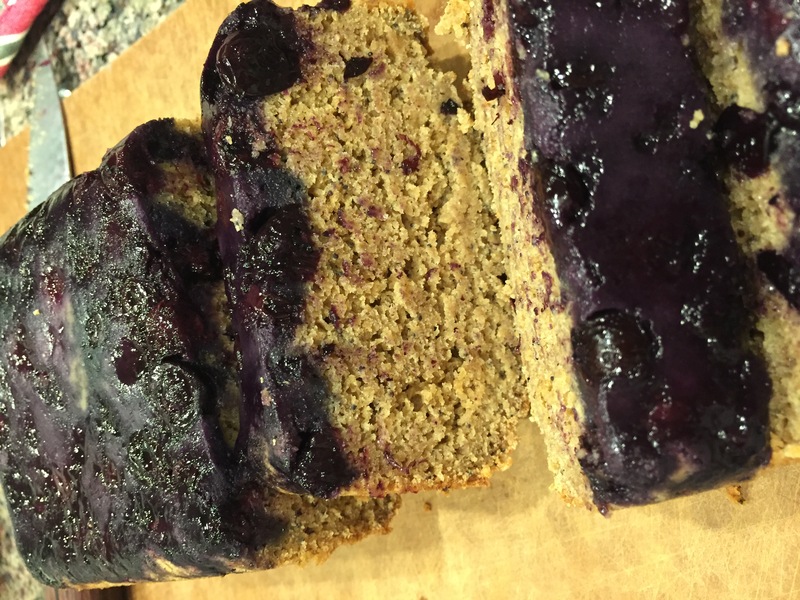 This entry was posted in Recipes and tagged aquafaba, bake, blueberry, dessert, gluten-free, lemon, loaf, oil-free, vegan by Shelly Detken. Bookmark the permalink.